Vanisia was created for Maria Christina of Austria, the great-niece of Queen Marie Antoinette of France. After the passing of her husband, King Alfonso XII of Spain, the widowed Queen Consort became Queen Regent. Given her newfound status, Maria Christina wished to make a style statement like her storied French relative. There are 25 reviews of Vanisia. Creed Vanisia seems to have the reputation of being a nice, sophisticated vanilla fragrance that perhaps is antiquated and feminine. I agree on all parts. Vanisia brings together some citrus (bergamot) and floral (rose, jasmine) elements while leaning on the usual base of ambergris mixed with a sharp, woody hint of sandalwood, and of course the dominant vanilla. It's certainly more acerbic at the opening and smoother in the dry down, as it usually goes. Again, Vanisia leans feminine and antique, but these are both what I enjoy about it since these are frankly distinguishing characteristics vs. most vanilla-intensive fragrances out on the market today. Certainly worth trying if you're a vanilla fan like I am. For all the times I have said I am frustrated with Creed - especially their feminine line - Vanisia redeems the line. I have a bottle of the older Vanisia, so I have no idea how it compares to the newer juice, but my hope is that they do not vary by much. This is such a nice representation of the Oriental genre. I get a very clear amber-y feel from this, though it's not the kind you get from scents such as Amber Absolute or Ambre 114. This is more "rose dusted" amber and it may even be actual ambergris. There is a roundness to this in the dry down that makes me think with it being a vintage bottle, it may have real Mysore as well as real ambergris - the subtlety is so fine that if this was done with aroma-chemicals, it was done with a rather masterful hand! I am giving it 4 stars for now, but it could move to 5...I need to wear it more and in more climates to see how it works. So far, though, it is different enough from Lyric and Duetto to keep in my collection. The bergamot I get in the opening is elegant and balanced out by a gentle vanilla; they both make more of a well-contained and not very loud opening blast. Elegance is what describes this creation in my skin: the drydown with its traditional rose-jasmine dyad is well - balanced, and merged into a nice sandalwood That is very much in the background. The vanilla remains present as a discrete overarching theme, and in the base the well-known Creed-esque ambergris finish emerges as usual. With its vanilla theme blended well with the other fresher and floral complements this is a great choice for autumnal days. The performance gives moderate sillage, adequate projection and four hours of longevity on my skin - not great but acceptable. This is a vanilla for people who dislike its intrusive and cloying versions; it is never overly sweet here. Well-blended and using very high-quality ingredients, this is an elegant vanilla indeed. 3.5/5. I would classify this scent as a floral/spicy/oriental kind of fragrance. Upon application, I got notes of ‘dirty’ citrus, amber, jasmine and rose. Very intense and sensual opening which made the scent rough on the edges initially. As time passed the scent becomes more tamed and the citrus eventually faded into the background. In the heart, the amber begins to soften becoming slightly sweeter thanks to the presence of vanilla. Towards the base, the sandalwood combined with a backbone of ambergris join the amber/vanilla and floral notes formulating a really nice drydown. Longevity I got a good 6-8 hours while the silage was moderate for the first several hours. I couldn’t exactly find the right occasion to wear Vanisia but I think it would be best worn in the colder months. I would have to say this is more of an ‘amber-based’ fragrance rather than a ‘vanilla-based’ fragrance, particularly in the drydown where the amber is most dominant. This is quite the opposite in Angelique Encens where the vanilla dominated over the amber in the drydown. 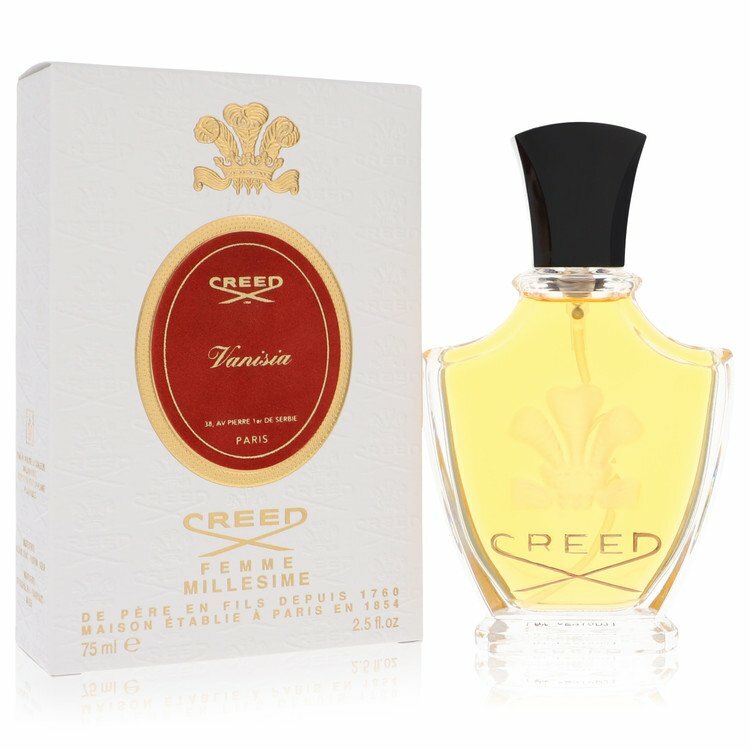 Personally I prefer Angelique Encens over Vanisia by a wide margin, but nonetheless both are well made fragrances from Creed. There are no member images of Vanisia yet. Why not be the first?